PM, Aga Khan open Ismaili centre - 2010-05-28 | Ismaili.NET - Heritage F.I.E.L.D. The Ismaili Centre will be a gathering place for prayer and a space for intellectual discourse while the museum will be an education project of the Aga Khan Development Network, which will gather, preserve and display artefacts symbolizing the heritage of Muslim civilizations. The two centres will be joined by a park and are expected to be completed by 2013. “Canada is honoured to have been chosen as the site for these important institutions,” Harper said. The Aga Khan said the new site will be a place of prayer and community. “It will help people understand and embrace the power of human diversity. The museum will be a place for sharing stories through art and artefacts. Stories of love, loss and joy and it will have a strong education aspect,” he said. Harper granted the Aga Khan an honorary citizenship, something only four others have received including Nelson Mandela and the current Dalai Lama. 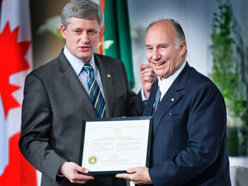 The Aga Khan said he was honoured to accept the citizenship. “I have always felt at home in Canada, but never more than this moment,” he said. He is the spiritual leader of the world’s 15 million Ismaili Muslims, of whom 70,000 live in Canada.